The outside space at Villa Horizon makes this house truly special! There's a private pool and separate children's pool as well as a large shaded eating area, for alfresco dining. With multiple terraces, you're spoilt for choice of where to enjoy the great sea views. 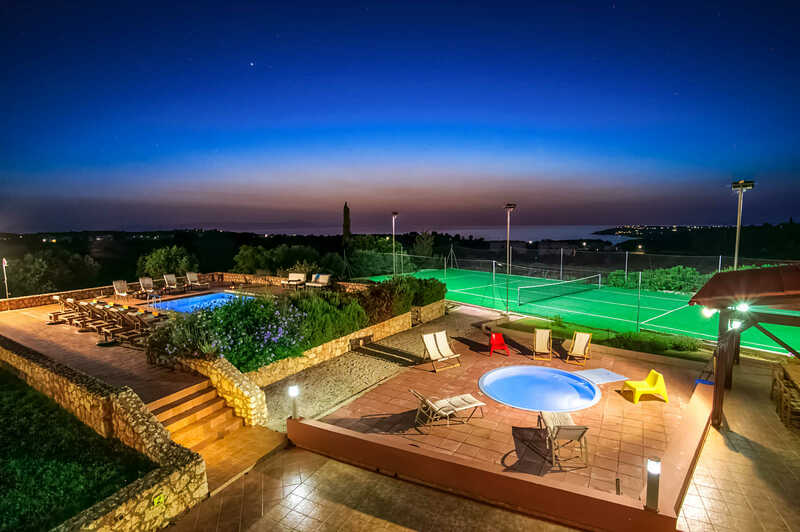 This 7 bedroom villa also has a private tennis court, sleek furnishings and is a perfect choice for groups, with 2 self-contained living areas. Pool heating, WiFi plus air conditioning/heating in all bedrooms and lounge are included. Spacious exteriors, your own tennis court, amazing sea views and contemporary furnishings. With 2 self-contained living areas, it's a great choice for groups! The private pool takes pride of place amongst the spacious grounds. This is a great place to relax and take in this wonderful setting. A pathway from the pool leads around to the pergola complete with brick BBQ, dining table and chairs. There is also a separate children's pool. To the side of this, there is also a second shaded seating area along with games tables for you to enjoy. If you are wanting to practice your tennis skills, you will have your own tennis court (not championship standard, basic racquets and balls provided). There is a gated entrance and driveway which has ample parking and 2 covered spaces. Due to the house having 2 separate living accommodations' there are 2 entrances. The first one is on the ground floor next to the children's pool. The second one is on the first floor, at the side of the villa, accessed via the exterior stairs. On the ground floor, there is a brightly furnished open plan area. There are 2 sofas, a flat screen TV, dining table with chairs and patio doors allowing the natural lights flows through the room. There is also a well-equipped kitchen. On the first floor is a spacious and contemporary open plan living area, with 2 sofas, a dining area and TV. There are 3 sets of patio doors leading out to a wraparound balcony which has a dining area with fantastic sea views. The first floor stylish kitchen has all the mod-cons and a fantastic seating area which is a great place to socialise. Within the ground floor living area, there are 3 twin bedrooms, one with patio door leading out to the back of the house. There is also a double bedroom and a separate shower room. The upper level accommodation is split across two floors. The bedrooms, located upstairs on the second floor of the villa, are accessed via an internal staircase. There are 2 twin bedrooms, 1 double bedroom with en suite bathroom and a separate bathroom. On the first floor there is also a separate shower room. All of the bedrooms have their own private balcony and views of the surrounding area and have high quality furnishings. This villa is registered and licenced by EOT Greek licensing association. This number is: 1042k10002984201. Villa Horizon is ideally located if you want to be within easy reach of many beaches and amenities. About a 5 minute drive from the villa will take you to Kalathas Beach. Around a 30 minute drive and you'll reach the historical town of Chania. Here you shall find a great selection of shops and restaurants to sample whilst on your villa holiday. There is also the harbour where you relax in one of the many bars and watch the world go by - perfect! The indoor market in Chania is an Aladdin's cave for those who like to try local cheeses and olives. This is also a good place to buy fresh fish to take back for the BBQ. The old town of Chania has lots of narrow alleys to explore and all sorts of shops. Chania Old Town Harbour has many waterside restaurants and bars where you can relax and watch the world go by. The largely undeveloped area of the Akrotiri Peninsular has some of the best beaches in the Chania area. One of those beaches is Kalathas Beach which is just a 5 minute car ride away from Villa Horizon. Here the sandy beach has sunbeds and umbrellas for hire, plus a taverna which serves local dishes. There is also another taverna is a short walk from the beach offering Cretan cuisine with sea views. Alternatively, if you can tear yourself away from Villa Horizon for the day, then why not go to Elafonissi Beach with turquoise water and pink corals. For the energetic visitors, the Limnoupolis waterpark is around a 40 minute drive away offering the thrilling black hole to the more sedate lazy river. Mega Drive go kart track can also be found on the outskirts of Chania where all ages can be catered for. The Samaria Gorge, the longest in Europe, entices many to visit the area. Come prepared with boots and rucksack to walk the entire length. For those less energetic, take a boat from the south coast and then walk as far as you want before returning to the taverna for lunch and sailing back. The main 18-hole golf course is located just outside the resort of Hersonissos. Villa Horizon is not available to book for season as it is sold out. Take a look here at the Crete villas that are currently on sale. Registered Paddy scuba diving centres are available in many resorts offering diving in caves at night, wall diving, as well as deep diving. In-experienced divers can catered for at selected locations. A pick up service is available to the venue. Villa Horizon was very good. Thank you to the owner and the Rep, who made the holiday exactly what we needed. We really enjoyed our time at Villa Horizon. The villa was perfect for a three generation holiday, celebrating two big birthdays. We had a wonderful holiday and Helen, our Rep, gave us many ideas for days out. Our only complaint was that we didn't book for long enough! The villa exceeded our expectations. We really enjoyed it. The villa is lovely and the host most charming. What can I say - what an amazing villa beautifully breathtaking, beautiful location, we had an amazing holiday and I would highly recommend this villa. The owner was very helpful and polite and couldn't have done more for us, including supplying us with 2 beautifully homemade cakes that his wife had made. The rep Helen was also very helpful and knowledgable about the area and things we could do as a family. All in all a perfect holiday thank you once again Villa Plus. Villa Horizon was superb. The facilities were excellent and were greatly enjoyed by our large 3 family party. The décor inside was beautiful and the grounds were extensive. The view of the sea and mountains was incredible. The vegetable plot was a delight, fresh tomatoes each day! The owner was rightly proud of his villa. The set up worked brilliantly for us. Six young people aged 16-25 on the ground floor and the parents on the top floor. Overall, it was a fantastic holiday and a wonderful villa experience.